I was examined by a traditional Chinese medicine man and he prescribed me some herbal powder that dissolves in hot water. It’s thick and dark and tastes like molassses mixed with licorice and root vegetables. No classes for me today. 😦 Will post more later today. Uh-oh! It’s time for another round of What is THAT?! China Edition. 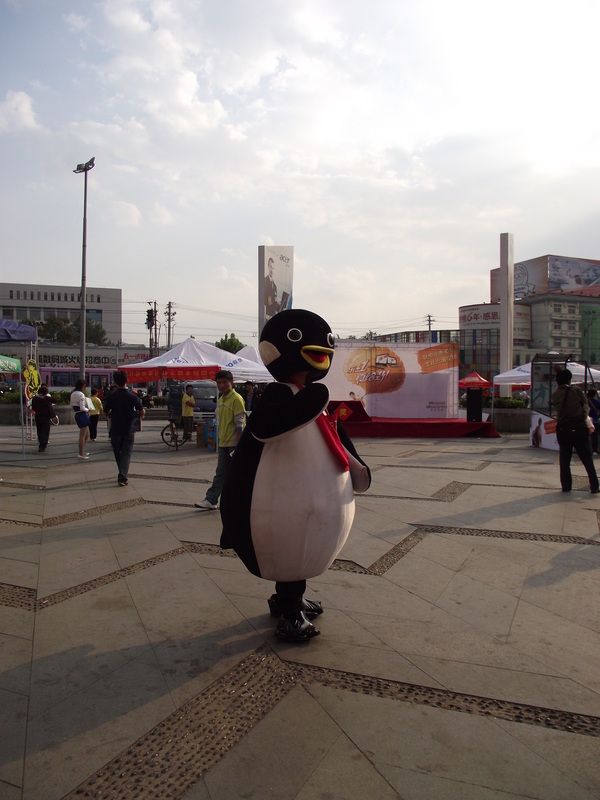 The answer to last round’s question is ‘C’, a mascot of Liaocheng University! 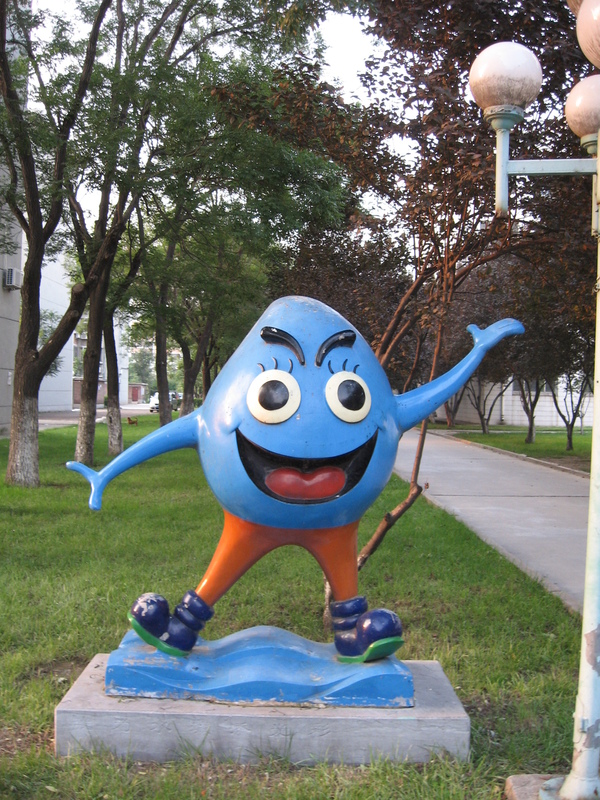 Liaocheng is known as the Water City, so it’s natural that its public university’s mascot is a wildly grinning, anthropomorphic water droplet, right? Congratulations to those who guessed correctly! I think there were only two of you 😦 ! And now for round two! This next strange and wonderful thing was discovered in Jinan. No multiple choice this time! Good Luck! China had off for the National Holiday from October 1-7. The holiday commemorates the founding of “New China” and serves as a memorial to those who died fighting in the Chinese civil war/communist revolution. Yvon and I decided to go visit his hometown, the capital of Shandong Province. And so our adventure began. We were expecting a long and arduous journey across the plains and scrubby forest and then across the great bridge that spans the Yellow River. We were more than pleasantly surprised when the two and a half hour road trip took only an hour and a half. We arrived in the bustling bus depot around 2:00 pm and set out into the sophisticated yet traditional metropolis known as the City of Springs. Despite being in a city at least five times the size of Liaocheng, the air is easier to breathe here. People don’t stare at you for being a weird foreigner. This is exactly what I needed after being in small town China for a month and a half. Jinan is known for its springs. Jinan is springs. It is said that in ancient times, when you stomped on the ground, water would gush from your foot print. I believe it. The springs are uncountable due to tiny springs creating themselves every day, bursting from cracks in the ancient walls and stairs. A river runs through the center of Jinan watered entirely by springs. Local people and tourists alike come to the springs to play, meditate and to replenish their water supply. They bring buckets and bottles and teapots, fill them up and take them home. This is the purest, cleanest most delicious water in all of China- maybe in all of Eastern Asia or the world. Each spring has a name that usually hints at a story. Nine Maidens Spring. Three Tiger Spring. Happiness Spring. Eternal Security Spring. Pipa Spring. Chrysanthemum Spring. Pearl Spring. After exploring the Three Tiger Spring (officially the “Black Tiger Spring” but no one calls it that), we headed to the Spring Square, the heart of Jinan and a symbol of the city’s spirit. A giant mostly paved park complete with kite fliers, running children, teenaged hordes, seniors practicing tai chi and a gargantuan underground department store complex. In the center of the square lies a tall abstract sculpture which serves as the symbol of the place. Beyond the sculpture is a monumental lotus flower themed fountain that puts on nightly fountain and laser light shows. From there we walked a short while to the “Golden Street”, Jinan’s Fifth Avenue. Food vendors serving Japanese snacks and sugar plums and candied haw line the street (popular with teenagers). From the ritz and bright lights of the Golden Street we went to a magical place known simply as the ‘Snack Street’. The street pulses with people from all walks of life holding fistfuls of yangchaur (spiced mutton shish kebab), eating sushi and stinking dofu and sauce bread out of take-out containers. Street vendors and small restaurants line the alleys, feeding the hungry masses through take out windows. Besides the sushi, stinking dofu and chuar you can find kimchee, Thai fruit cakes, Hawaiian shaved ice, fried chicken and various chicken parts, rotisserie turkey Chinese style and anything else from greater eastern Asia. This is a folk-gastronome’s paradise. It’s so good, your wife will be jealous. And my favorite: So delicious, you’ll want to marry it. But seriously, the bread was delicious. In-friggn-credibly delicious. Day Two is soon to come… STAY TUNED! First some photos of the Mid-Autumn Festival held in mid September. There is no ‘festival’ as I think most Westerners think of when they hear ‘festival’. The Chinese people call a ‘festival’ what we would call a ‘holiday’. First Dr. Garard and I ventured into the Dongchan Lake District for some lakeside sun and moon gazing. The following day Yvon, the doctor and I went to the Jian di park/zoo district. And now for a game! This is the first instalment of What the Hell is That? China Edition! First some views of the Foreign Language building, my office, classroom and the lovely views from the office and classroom.